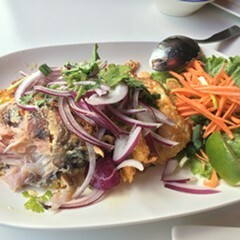 Authentic Thai cuisine, including specialties from the northern region of Issan. It's not like there's been a revolution against boring Thai food in Chicago, but there's certainly a healthy resistance, and it was born in Chai and Vanna Gumtrontip's little Lincoln Square restaurant. 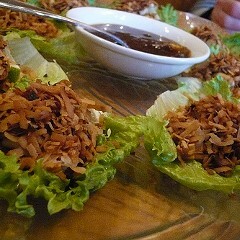 Spoon was the first place in the city willing to serve authentic, fully flavored Thai food to non-Thais. It began in the summer of '03 with the discovery of the Thai-language "secret menu" by a handful of obsessive chowhounds, who had it translated and began plumbing the depths of its aggressive, brilliantly seasoned dishes. Word spread, and though waitstaff sometimes had a hard time believing that non-Thais had the stomach for the real stuff (some servers still do), eventually they stopped blinking and began relinquishing funky Issan sausage, rich boat noodles, banana blossom salad, one-bite salad, incendiary papaya salad sprinkled with dried shrimp or pickled crab, and the miraculous Thai-style fried chicken (kai thawt), deeply penetrated with lemongrassy, peppery flavors and served with a tamarind dipping sauce. I'm a long way from navigating the depths of this vast repertoire, but so far some of my favorite items are naem khao thawt, a tangy, crispy fried-rice salad with peanuts, cilantro, and pressed ham; phat phrik sa-taw muu sap, minced pork and bitter beans; and Issan-style minced duck salad.